AEBO is one of the leading thermal transfer ribbon coating and slitting manufacturers in Nanjing, South-East China. Our main products include barcode ribbons(wax, premium wax, wax-resin, resin and near edge) which are widely used in the areas as Inventory & Warehouse, Logistics & Transportation, Retail, Pharmaceutical & Healthcare, Garment & Apparel etc. Provide outstanding printing results on different substrates to meet your diverse requirements. So far, we have six high speed coating manufacturing lines of TTR and 12,000 square meters factory in Nanjing. Meanwhile we also have overseas distribution centers located in USA, Germany and Iran. AEBO has more than 200 experienced employees to service our customers over 155 countries and regions throughout the world. 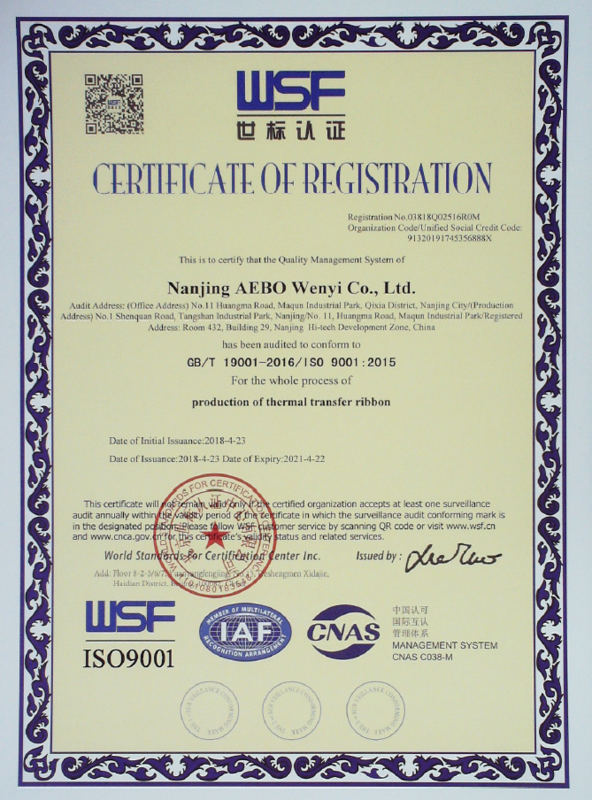 Our TTR products have passed through ISO9001, ISEGA and SGS certificates. Trusted by clients over the world, AEBO has been built high reputations in the areas of thermal label printing and barcode printing.